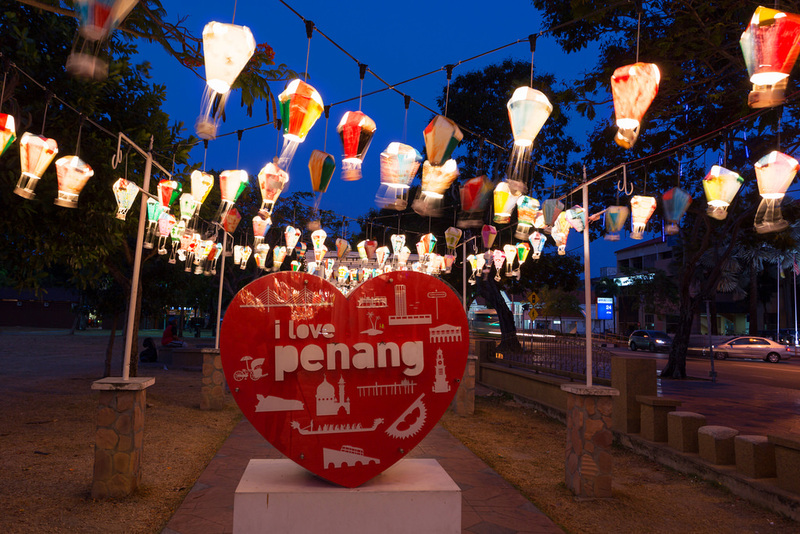 I’d arrived in Malaysia without a plan. My itinerary was wide open, with over two weeks to fill. Borneo jumped out as a priority that deserved at least half my time, but that still left plenty of room to see more of peninsular Malaysia. 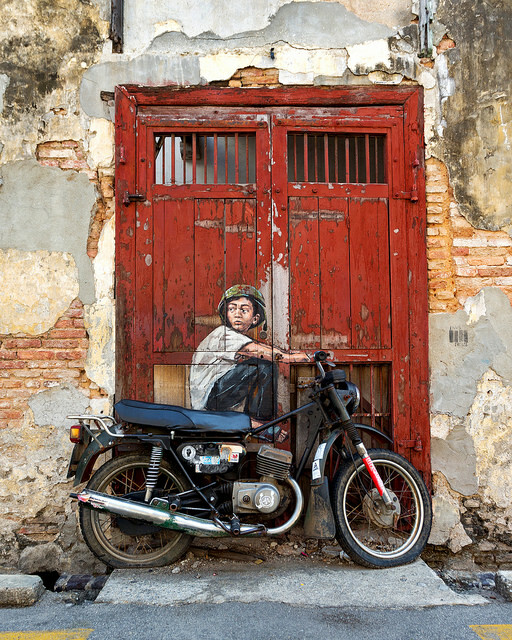 Penang wasn’t an obvious choice, given that its draw for most travelers is culinary. 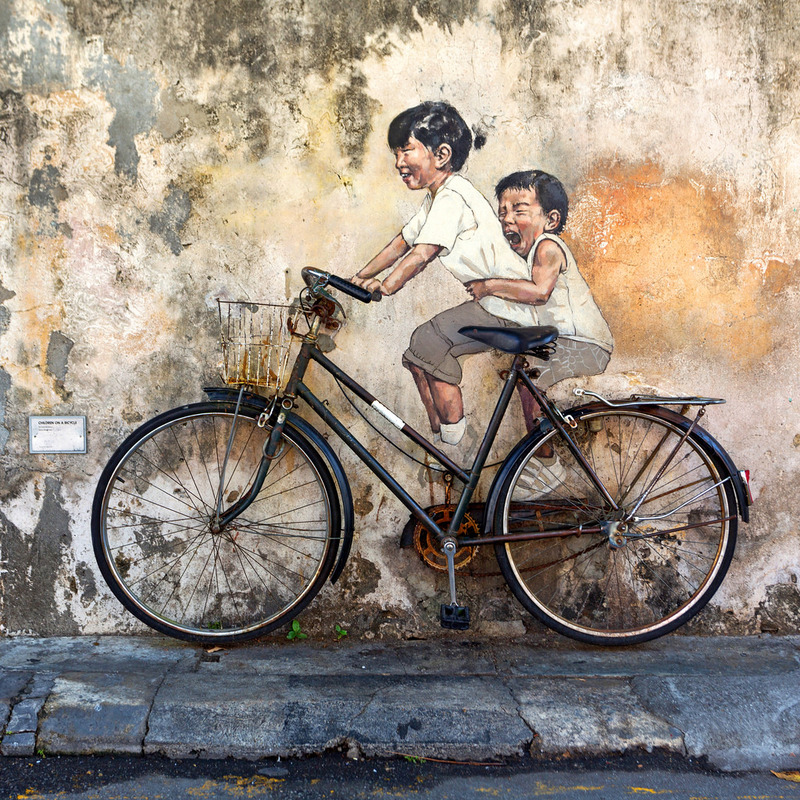 My guidebook calls Penang “the food capital of Malaysia.” But George Town, Penang’s largest city, is a Unesco World Heritage Site where white mosques stand next to ornate Chinese clan houses and crumbling British colonial buildings. That sounded interesting enough to warrant a couple of nights. My bus arrived at George Town in the late afternoon. After checking into a hotel I headed out to explore the city and try the food at the renowned hawker stalls. 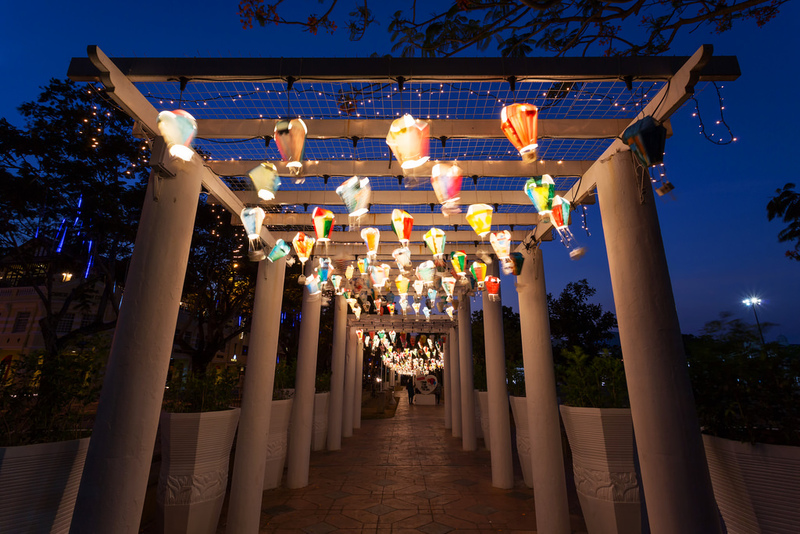 I passed Fort Cornwallis just after sunset and stopped to photograph a display of colorful lamps decorated as hot air balloons. 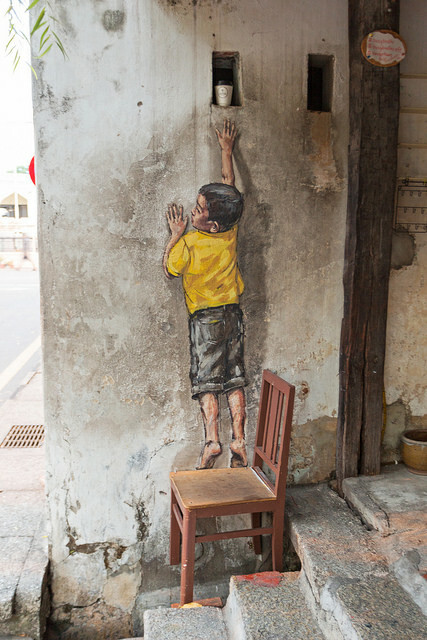 The next morning I went hunting for the work of a Banksy-like Penang street artist named Ernest Zacharevic, who mixes paintings with physical objects. The food in Penang didn’t disappoint. Even my unsophisticated palate could appreciate that it was unusually good. I tried char kway teow (stir-fried noodles with egg, vegetables, shrimp, and Chinese sausage), char siew (barbequed pork), and nasi lemak (rice with chili paste, anchovies, cucumber, peanuts, and a boiled egg) and enjoyed them all. 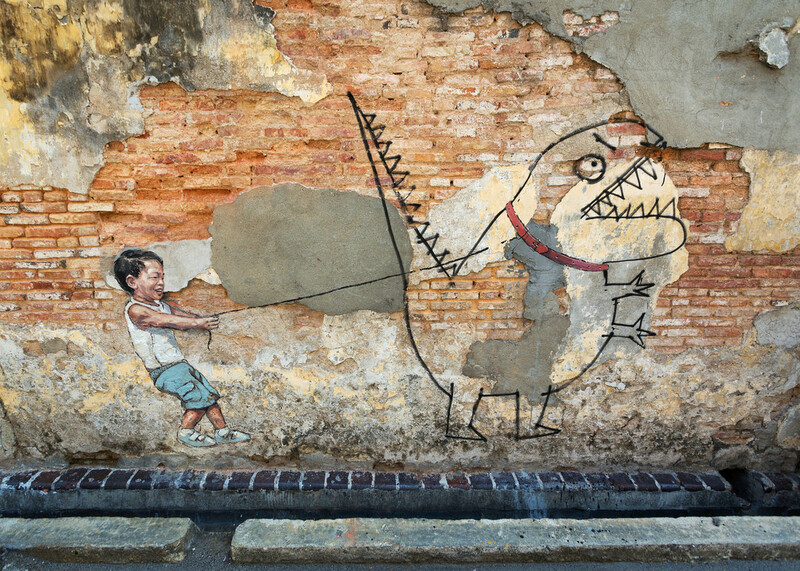 From Penang I made the five-hour bus trip back to Kuala Lumpur, where I had a couple days to wander around and work on photos before my flight to Kuching in Malaysian Borneo. 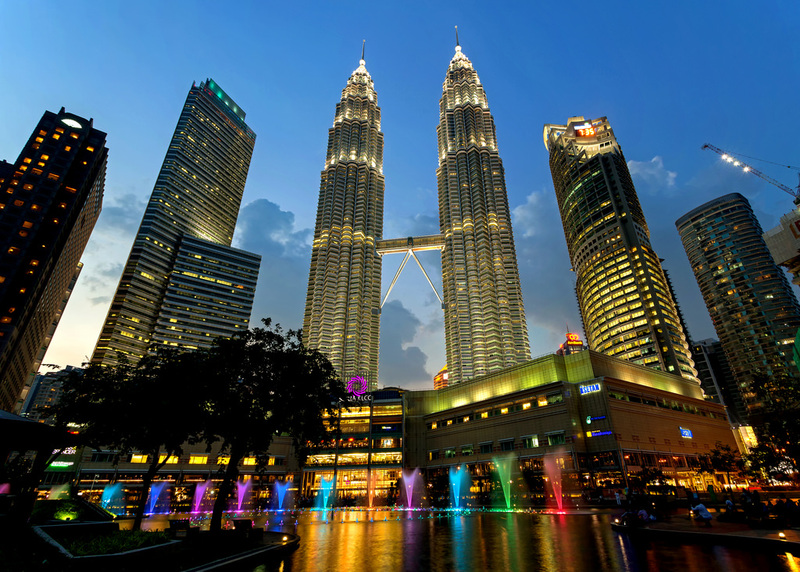 I couldn’t resist another visit to the Petronas Towers at sunset, this time trying out the view from City Centre Park.